A customer journey map is a narrative of the customer’s experience. It should begin with the first contact and take the prospect through establishing engagement, purchase and into a long-term relationship. The story should cover customer needs, expectations, questions and feelings to get a better understanding of the customer experience from the user’s perspective. 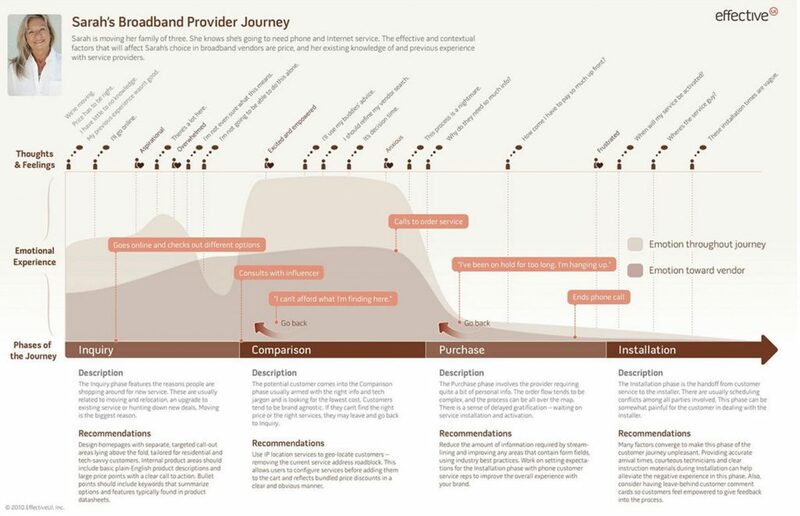 A customer journey map can take many forms, but normally it is an infographic such as this example from Smashingmagazine.com. The process of developing the customer journey map helps to identify gaps in the journey, where there may be pain points or where it disrupts the user flow. The output can be an effective way of communicating these issues to the wider business to obtain support for dealing with the issues identified. Also see Buyer Legends. Customer story – How to use buyer personas to improve conversion.